While I'm waiting for my next thread order to start my March quilts i took this opportunity to finished my second batik quilt. I had enough fabric left over from the quilt that is hanging in my shack, to make another one. This one i quilted with a swirly vine free hand design. 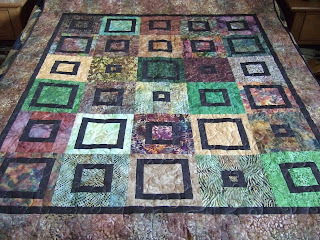 I have caught up with all my quilts that needed quilting so i better get piecing again. I finished 4 of my own this month plus 8 client quilts. Yeah... you go girl.. Love the Batik. Can you define Batik for me? 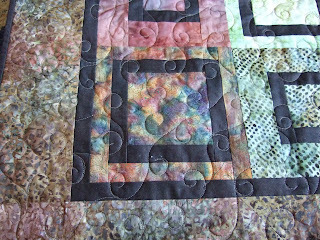 Batik is the type of fabric that i used on this quilt, i love working with batiks. Batik fabric is made using a specific dyeing process very similar to make Ukrainian Easter Eggs...using wax to mark the designs. It is very hard to tell the front or back of a batik fabric and it has a very tight weave making it very nice to cut..it does not fray easily. Look at the celtic wallhanging that you have that i made..the navy border and celtic bias strips are made with Batik fabric.